These all tend to signal potential shifts in the broader economy. For example, when unemployment claims drop or building permits increase, the economy may be improving. Conversely, a rise in unemployment claims or a drop in building permits could signal a downturn. These factors help to define the current state of the economy. 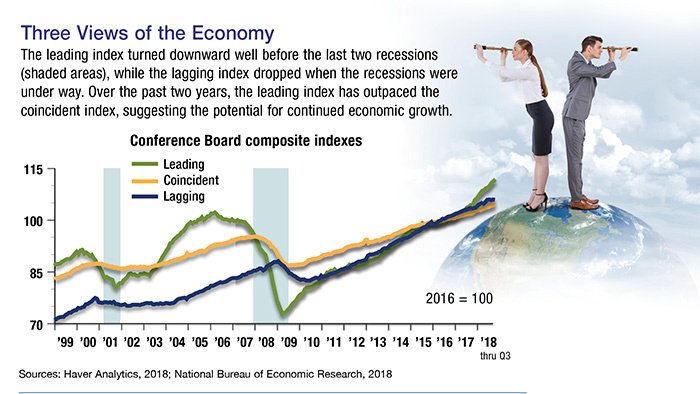 Although economic trends are important, it might not be wise to place too much emphasis on these indicators when making investment decisions. A sound investment strategy should be based on your time frame, goals, and risk tolerance. All investing involves risk, including the possible loss of principal. Lawrence B. Keller is a Registered Representative and Financial Advisor of Park Avenue Securities, LLC (PAS), OSJ Address: 355 Lexington Avenue, 9th Floor, New York, NY 10017, (212) 541-8800. Securities products/services and advisory services are offered through PAS, a registered broker/dealer and investment advisor. Field Representative, The Guardian Life Insurance Company of America (Guardian), New York, NY. PAS is an indirect, wholly owned subsidiary of Guardian. Physician Financial Services is not an affiliate or subsidiary of PAS or Guardian. PAS is a member FINRA, SIPC. Check out your broker with BrokerCheck. FINRA oversees the people and firms that sell stocks, bonds, mutual funds and other securities. Simply type in your current or prospective broker’s name to see employment history, certifications, and licenses—as well as regulatory actions, violations or complaints you might want to know about. You also can get information about your broker’s firm. There’s no reason not to check. The Registered Representative is not securities licensed in all 50 states. To find out if the Registered Representative is licensed in your state, please contact Theresa Nowak at (516) 677-6245. Lawrence B. Keller is insurance licensed all all states (CA insurance license #0C37340, MN insurance license #20498309). The material is strictly intended for individuals residing in those states. No offers may be made or accepted from any resident outside these specified states. Harry R. Wigler and Adam A. Sandman are Field Representatives of The Guardian Life Insurance Company of America (Guardian), New York, NY. Neither Park Avenue Securities, Guardian, nor their representatives render legal or tax advice. Please consult with your attorney, accountant, and/or tax advisor for advice concerning your particular circumstances. The associates of Physician Financial Services are not licensed to sell insurance in all 50 states. To find out if an agent is licensed in your state, please contact Theresa Nowak at (516) 677-6245. The information or opinions contained in the Internet site should not be construed by any consumer and/or prospective client as an offer to sell or the solicitition of an offer to buy any particular investment product. The information contained herein is directed solely to those individuals who reside in jurisdictions in which the representative is registered in the state where the consumer and/or prospective client reside. Any subsequent direct communication with a consumer and/or prospective client shall on be conducted by a representative that is registered in the state where the consumer and/or prospective client resides.